Cats are very bonded to their own territory so going to a grooming parlour leads to increased stress levels simply as a result of being in a strange environment. Most parlours are geared towards dog grooming (There are no exclusive cat grooming parlours) so your cat not only feels stressed by the travel but also to the sight, sound and smell of dogs. One would hope that most parlours at least separate the rooms both species are groomed in but I know from first hand experience that this is not always the case! Greasy skin and coat combined with natural shedding causes matting. Once a small tangle or mat forms, it grows very quickly. The only real defence against tangles and mats is regular bathing and drying done by a professional cat groomer who truly knows what they are doing. Some groomers are not cat groomers and will groom a cat using products and techniques that can cause more problems. Most cats need to be professionally groomed every 8 weeks. Throughout any aspect of grooming, the tolerance level of the cat varies and we make every effort to minimise distress. While it’s possible to groom most cats, we can only do as much as the cat allows. Cats in a badly matted condition and cats with nervous dispositions have the hardest time during the grooming process and we will stop should we see the cats disposition deteriorate. If your cat gets too stressed or is unusually aggressive we will always recommend sending it to a professional vet, where it can be sedated before grooming. Anita can then groom your cat whilst sedated. We will never put money first EVER. A muzzle WILL NEVER be used on any cat. Don’t believe what you hear! Your cat may hiss, growl and howl out in protest during the grooming process especially cats that do not like to be touched or handled. It is very important that you know we are not hurting your cat!! What is happening here is a battle of wills and the beginning of a battle to establish hierarchy. Your cat will be trying all it can to attempt to frighten the groomer so that they stop and the cat then controls the entire situation. You may hear his or her attempts and become understandably anxious which is why I have added this paragraph. Cats are stubborn and 9 times out of 10 they will try all they can not to be groomed which is why most owners give up at the first sign of resistance and then call us in. We won’t give in and we will get the job done but please understand that your cat will never ever be put in any painful situation. There is a difference between a complaining cat and a stressed out cat. Please be assured that if any cat starts showing signs of stress we stop immediately. This is Star who gave her owners hell when they tried grooming her!! 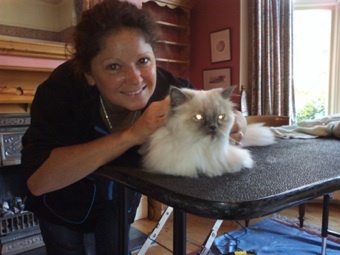 Anita Kelsey is a professionally qualified cat behaviourist and also runs a cat care company in Notting Hill. She is a regular featured writer for the Canine and Feline Behaviour Association’s web site and magazine. She has been a mobile cat groomer for 5 years now and has a loyal client base in and around London. Anita is happy to check your grooming tools and give grooming advice on her visits which makes for a very rewarding and unique experience from someone who lives and breaths cats! She is also happy to give BASIC behaviour advice should you be having a problem. Anita prides herself on compassionate low stress cat grooming and is known for her gentle approach. We have a very strict cancellation policy. We encourage clients to assist with the holding of their cat during any difficult shaving periods. This method has proved to be invaluable and helps calm the cat down. All clients, so far, have commented that they found, being able to become involved in the grooming process, very very rewarding and a special experience. This is not obligatory. As a professional mobile cat grooming service we bring all equipment, including towels, but we will need the use of a bath should you require a wet bath. If this is not possible then a dry bath will be administered. Your home will be left as we find it but with a very clean and happy kitty. All cat Shampoo’s and conditioners/wipes are by John Paul and are of the highest standard and tested on humans first, not animals! All towels are provided. HOW LONG WILL IT TAKE TO GROOM MY CAT? Unlike many parlours, we don’t work to a timer. Our full grooming process can take anything up to 2.5 hours for a normal groom. We work within each individual cat’s tolerance levels and take time out to give as much TLC during the process as is needed. We generally take regular 5 minute breaks for your cat and may call you into the room at individual stages for you to give a few cuddles and re-assurance. Sometimes it takes longer due to your cats tolerance levels or the state of the coat. We use a professional hand held animal hairdryer. Most cats can tolerate the drying process but if a cat is very anxious about the dryer then we will make the decision to leave your cat to dry naturally. It’s quite rare that this happens but we try to listen to the cat and do what’s best for them.